Cuisinart Fondue Maker Just $42.99! Down From $110! PLUS FREE Shipping! You are here: Home / Great Deals / Amazon Deals / Cuisinart Fondue Maker Just $42.99! Down From $110! PLUS FREE Shipping! Amazon has this Cuisinart Electric Fondue Maker for just $42.99 down from $110 PLUS FREE shipping! 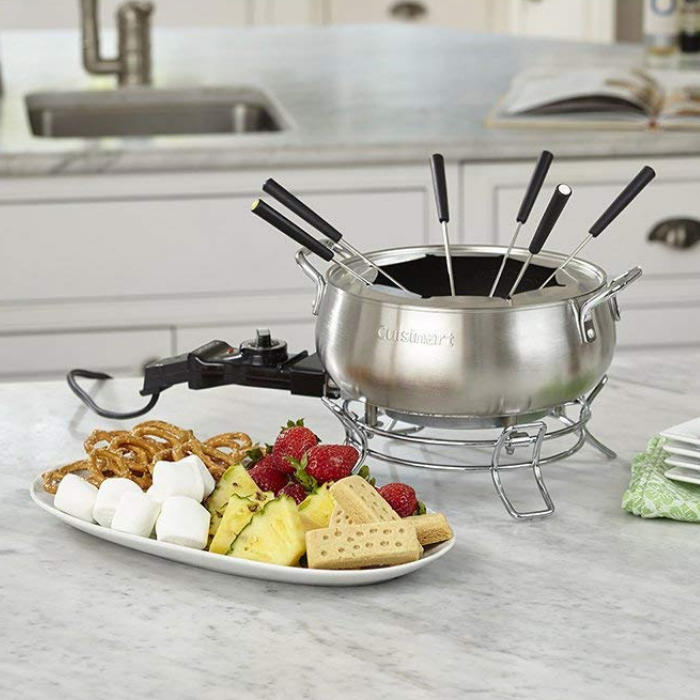 Cuisinart Electric Fondue Set Now fondue is easier than ever. The stick-free Cuisinart Electric Fondue Set has a heating element built into the base of the pot and a thermostat that adjusts to a wide range of temperature settings. Consumers can prepare chocolate cheese, broth or oil fundues in this elegant quart brushed stainless pot. As always, Cuisinart makes cleanup easy. The nonstick pot offers superb food release and the entire unit is dishwasher safe.